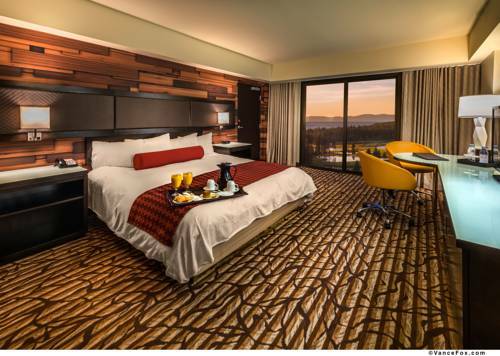 MontBleu sits on a total of 21 acres and is set to create a new standard of luxury in Lake Tahoe the 17-story MontBleu has 437 spacious rooms and suites featuring breathtaking views of the tranquil shores of Lake Tahoe and the majestic Sierra Nevada mountains. Rooms and suites range from 424 sq. ft. to 1250 sq. ft. All MontBleu rooms and suites feature the luxurious Bleu Could Bed and a complete set of premier toiletries. MontBleu features 40000 square feet of gaming space including more than 900 slot machines and 50 table games including Blackjack-Roulette-Craps and a variety of other popular games. MontBleu recently opened a brand new poker room offering of the popular Texas Hold Em at various buy-in levels. The newly remodeled race and sports book The Zone features 40 large-screen TVs projection screens and plasmas showcasing the days hottest action. Located at Stateline easy access to Heavenly Ski area.